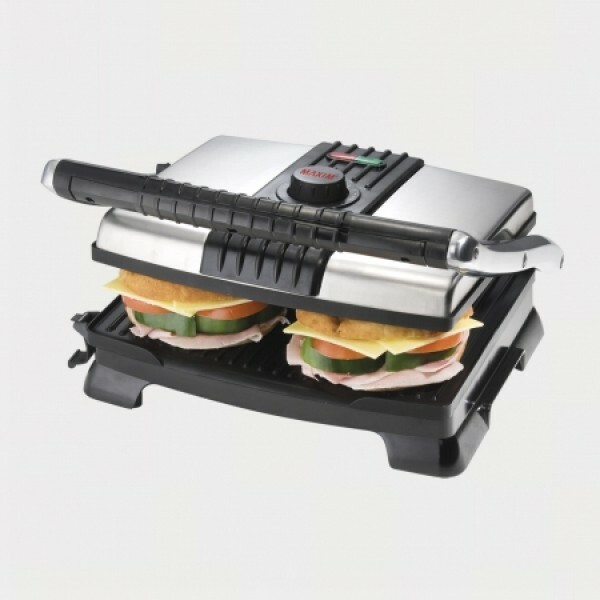 Enjoy a variety of delicious toasted or grilled sandwiches with the Maxim Kitchenpro Sandwich Press and Grill. This massive grill will let you toast up to 6 slices of bread at once, and will accomodate thicker slices of bread with the adjustable lid hinges. Not only that, but this is ideal for grilling your favourite meats such as chicken, beef or fish without any additional fat. You can also grill your favourite vegetables at the same time, giving you true one appliances cooking for the entire family. The easy to clean non stick grill plates make washing up a breeze. Toast sandwiches, foccacias, bagels, baguettes, wraps and more. Grills steak, sausages, cutlets, beef and vegetable burgers. Top and Bottom non stick grilling surfaces. 'Floating' top plate for various thickness cooking. Large cooking plate area of 32cm x 26.5cm. Toast up to six sandwiches at once!.